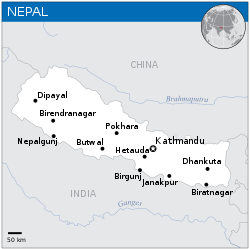 Nepal (pronounced /nɛˈpɔːl/ (deprecatit template) ne-PAWL Nepali: नेपाल [neˈpal] (help·info)), offeecially the Federal Democratic Republic o Nepal, is a landlockt kintra in Sooth Asie. It is locatit in the Himalayas an bordered tae the north bi the Fowkrepublic o Cheenae, an tae the sooth, east, an wast bi the Republic o Indie. 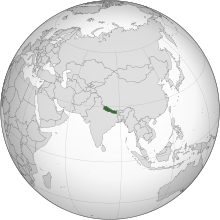 Wi an aurie o 147,181 square kilometres (56,827 sq mi) an a population o approximately 30 million, Nepal is the warld's 93rd lairgest kintra b land mass an the 41st maist populous kintra. Kathmandu is the naition's caipital an the kintra's lairgest metropolis. Nepal haes a rich geography. The muntainous north haes aicht o the warld's ten tawest muntains, includin the hichtest pynt on Yird, Munt Everest, cawed Sagarmatha in Nepali. It contains mair nor 240 peaks ower 20,000 ft (6,096 m) abuin sea level. The fertile an humid sooth is heavily urbanised. Bi some measures, Hinduism is practised bi a lairger majority o fowk in Nepal than in ony ither naition. Buddhism, tho a minority faith in the kintra, is linkt historically wi Nepal as the birthplace o the Buddha. Thare are 3 different buddhist tradeetions: Himalayan Buddhism, Buddhism o Kathmandu Valley (maistly Mahayana an Vajrayana), an an aa the Theravada Buddhism. Aboot hauf o the population live belaw the internaitional poverty line o $1.25 a day. A monarchy throughoot maist o its history, Nepal wis ruled bi the Shah dynasty o keengs frae 1768, when Prithvi Narayan Shah unified its mony sma kinricks. In 2006, housomeivver, a decade-lang Fowkrevolution bi the Communist Pairty o Nepal (Maoist) alang wi several weeks o mass protests bi aw major poleetical pairties o Nepal culminatit in a peace accord, an the ensuin elections for the constituent assembly votit owerwhelmingly in favor o the abdication o the last Nepali monarch Gyanendra Shah an the establishment o a federal democratic republic in 28 Mey 2008. The first Preses o Nepal, Ram Baran Yadav, wis sworn in on 23 Julie 2008. ↑ 2.0 2.1 "National Population and Housing Census 2011 (National Report)" (PDF). Central Bureau of Statistics (Nepal). Archived frae the oreeginal (PDF) on 18 April 2013. Retrieved 26 November 2012. ↑ 2011 Nepal Census Report Archived 18 Apryle 2013[Date mismatch] at the Wayback Machine. ↑ Shrestha, Khadga Man (2005). "Religious Syncretism and Context of Buddhism in Modern Nepal". Voice of History. 20 (1): 51–60. ↑ 6.0 6.1 6.2 6.3 "Nepal". International Monetary Fund. Retrieved 12 March 2016. ↑ "The World Factbook : Rank order population". CIA. ↑ "CIA Factbook, Nepal, "People" section". Cia.gov. Retrieved 29 July 2009. ↑ "Nepal's first president sworn in". Radio Australia. 24 July 2008. Wikimedia Commons haes media relatit tae Nepal. This page wis last eeditit on 27 Julie 2018, at 16:54.